eBay Portwest PU Palm Glove - 12 Pairs, A12012 PairsColors: Black, Gray, White, Blue, Orange, Yellow, PinkSizes: M-XXL. M (8-9"), L (9-10"), XL (10-10.5") and XXL (10.5-11"). These size measurements are hand measurements and should be used as a guide to choose the best size for you. For example, a person with a 8-9" palm circumference would order a size M. See our product pictures for our full gloves size chart! 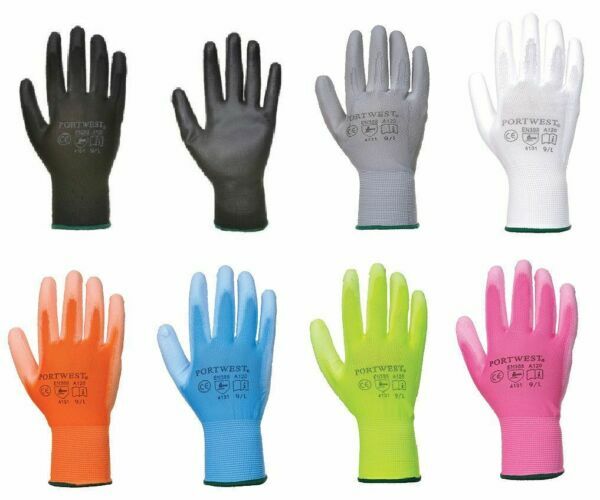 Product Description:Suitable for any workplace, this PU Palm Glove is perfect for intricate tasks while also providing maximum abrasion resistance. Product Features:Perfect for intricate tasksMaximum dexteritySmooth PU coating for increased abrasion resistancePalm dipped to increase dexterity and ventilation100% Breathable seamless linerFabric Information:75% Polyester25% PUSafety Standards & Certification:ANSI 105-2011EN420EN388About Workwear MartThank you for taking time to look at our eBay store. As you will probably have seen, Workwear Mart have been present on eBay for many years and we now have over 10k feedback – yes, we are enthusiastic about PPE, safety and everything to do with workwear. When you are at work, you need to be dressed in the best possible work clothing and we have been happy to serve thousands of eBay customers over the years. With our free delivery as standard, we send our orders to you as quickly as possible. To keep everything consistent and simple, we decided to sell only one brand of goods. A brand that we believe everyone can rely on – the brand is called Portwest. Portwest has been around for some time – they have over 110 years of experience and a heritage of quality, value and service, they are firmly established as a world leader in the design and manufacture of stylish, comfortable, high-quality workwear that meets recognised international standards. You can be rest assured that you are in good hands with Portwest! We chose Portwest because the brand is known to listen carefully to their customers. They continuously seek to improve their range by designing and using new materials as well as developing function in their products. Portwest has an extensive and unique collection of workwear, safety footwear and PPE protects people all over the world in diverse industries such as oil and gas, welding, mining, agriculture, transport, chemical, construction, warehousing, manufacturing and much more. They are specialists in hazard protection including flame, electric arc, chemical, molten metal, heat, cold, visibility, rain and ESD. You’ll find that we stock a vast proportion of their products here, in our eBay store. There should be something for everyone – at the right price, too.